02 Textiles was invited to exhibit at the 2012 Knitting and Stitching Show in London, Dublin and Harrogate (the definitive and best exhibition for lovers of textiles in the UK and Ireland). The show was a great success for the Group and the opportunity has been taken to take the exhibition to a new venue in “The Workshop” at Snape Maltings. It now includes new work to replace some of the pieces which were sold at the Knitting and Stitching Show. 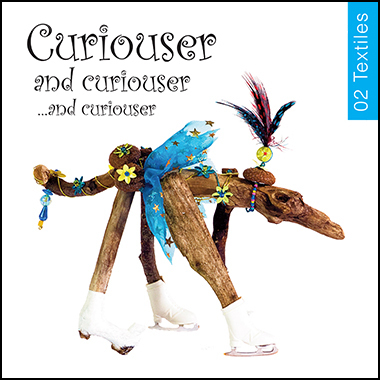 As at the Knitting and Stitching Show, 02 Textiles exhibition "Curiouser and curiouser ... and curiouser" aims to amuse, surprise and intrigue the visitor, and its communal project is titled "Shelf Life". A book has been produced featuring works from the Exhibition by each member of the 02Textiles Group, as well as every piece of "Shelf Life" in the original show. You can also purchase it from us via this website.